I am finally over this Hoosier series. I am sure there are people, places and things I forgot. But tomorrow is the New Year and these post have to stop! 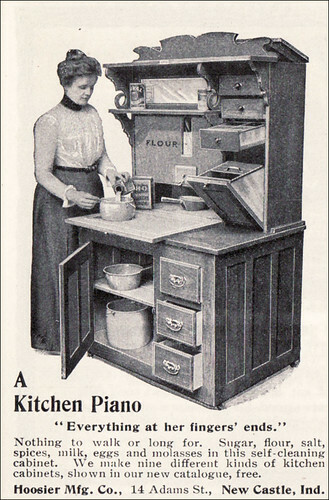 I could do a whole site on The Hoosier Cabinet. In the late 30’s and 40’s the Hoosier lost it’s popularity. Smaller kitchens with hanging cabinets became the rage. An end to the year, an end to the Hoosier Manufacturing Company and an end to this series! This blog will be a year old tomorrow. Happy New Year everyone!